When you meet and marry someone on my side of thirty, it's a crapshoot whether or not you're going to like that person's friends. I mostly got lucky. David has some great friends, and among my favorites are his friends Warren and Diane. Warren has an indelible quality: he is a punster. His birthday was on Sunday, but he celebrated on Monday with a football-themed viewing party. I'm not a football person despite the fact that I grew up in a football-crazy place, so I don't want to hear it when I confess I left ten minutes into the game. Diane commissioned a Raiders-themed cake with beautifully colored fondant, but I didn't take a picture of it. I don't want to hear it about that either. Please note that this post has nothing to do with football or fondant. I tell you this in explanation for the pun-ny quality of the title of the post. It happens for a few days every time I've been around Warren, and I blame him personally. What this post is about is damn simple weeknight pasta made with the ear-shaped orecchiette. I think it's an underutilized pasta shape, myself. It holds sauce beautifully and it's fun just looking at it. There isn't much to this pasta, but it goes together in a snap and hits the slightly salty, savory target. To make this vegetarian, omit the anchovies. You could also substitute a different green for the arugula, such as spinach or rapini. If you're feeling daring, I think dandelion greens would be terrific in this recipe but I know their bitterness isn't everyone's cup of tea. 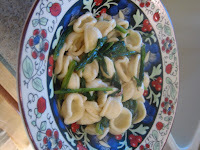 If you use rapini, the sauce will take longer to cook. Heat a large sauté pan over medium heat and add about 3 tablespoons of olive oil. 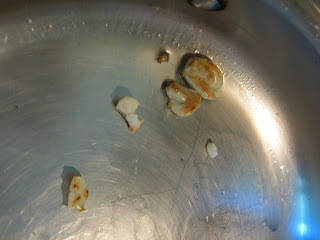 When the oil is warmed, add the garlic. Stir occasionally to make sure it browns and doesn't scorch, about 3 minutes. Add the anchovies, arugula, water and peppers--you might start with one and add the additional one later if you'd like more spice. 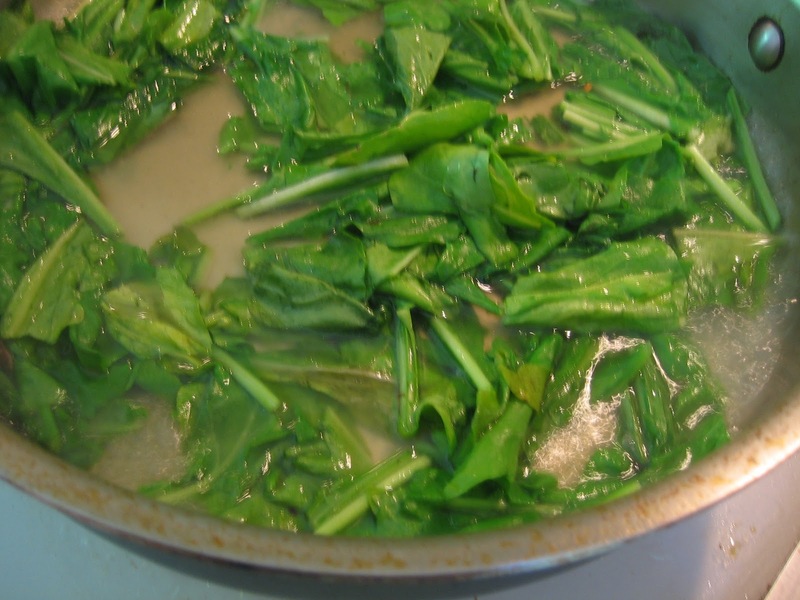 Bring these ingredients to a low simmer and cook for about 10 minutes, until the greens are very soft but not falling apart and the water is reduced. While the sauce is cooking, bring a large pot of salted water to a boil. Then add the pasta, and cook for about 10 minutes. Keep an eye on it, as this is a pasta you'll want al dente, checking at the 8-minute mark. If the greens dry out while the pasta is cooking, add a few small spoonfuls of either pasta cooking water, vegetarian stock or chicken stock to the pan. Drain the pasta thoroughly and return the cooked pasta to its pot. Toss with the greens mixture and taste for seasoning. You may want to add a dash of stock, sea salt or pepper; when you like the seasoning, drizzle the pasta with olive oil and toss. Serve family-style in a large warmed bowl, adding a generous dusting of fresh pecorino cheese at the table. Serve immediately--this doesn't improve with sitting. Serves four as a main course. Wine pairing: This is a fairly plain pasta dish, although it has a little bite. Serve with a zesty white such as Vinho Verde, or a very light red like a rosesse (shown above) or Beaujolais-Villages. Peppers and anchovies! Lots of flavor without a lot of ingredients. Lovely pasta dish-yum! Yum and yum! My famiy will LOVE this. btw are you on Facebook? You definitely should be!!! Join Helen's Cooking on Facebook!!! <3 ur blog! 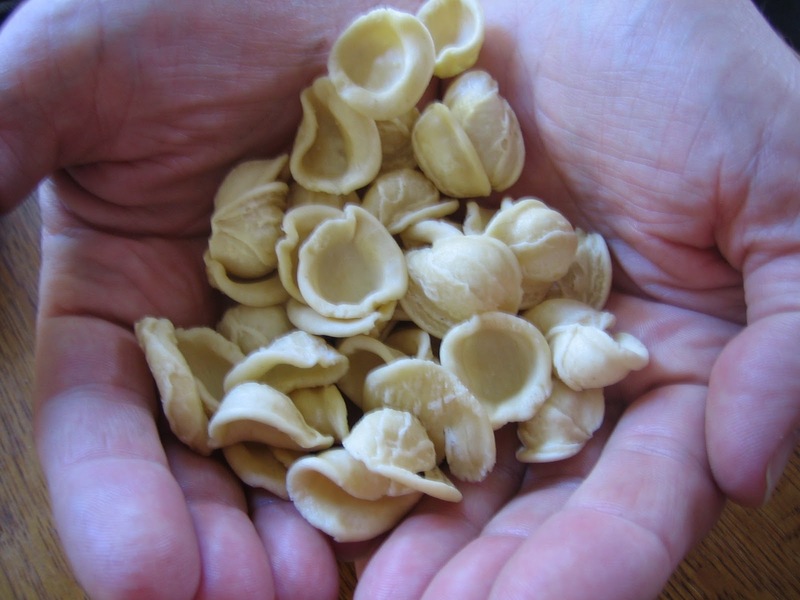 Orecchiette are such a fun pasta shape - you've made a beautiful dish out of them! It might be the wonderful presentation that reeled me in...! This does look yummy! I love orecchiete, but I don't cook with it very often, but you're right, it is a great pasta because it holds all the sauce! A dish full of taste! Nice recipe! Delicious! 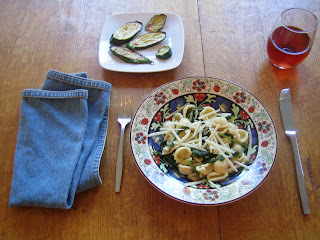 I love easy weeknight pasta dishes and this is one of my favorite shapes! Thanks for all the comments! I have another wonderful orecchiette recipe with chicken sausage ragu that I will post another time. @Helen, thanks so much for your support! I have not created a Facebook page yet, but it's on my to-do list. I think orecchiette is under utilized also. And I am probably guilty of that, too! This pasta dish looks wonderful. 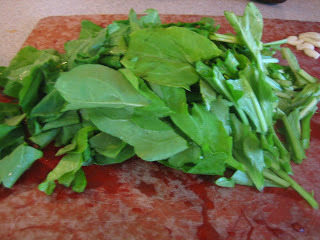 I love arugula, anchovies and pecorino romano! I'm looking forward to trying this!